"This action is worse than rigging on election day. It is an obvious case of interference and setting the stage for a total compromise, and we are calling on the US/UK government to activate their visa restrictions on Buhari and his family, Abubakar Malami, the Attorney General of the Federation; Justice Tanko Yusuf; Danladi Umar, the Code of Conduct Tribunal Chairman, and others involved in the putsch against the Chief Justice of Nigeria. Some Civil Society Organisations (CSOs) have staged a protest in Abuja, asking the United States of America and the United Kingdom to "activate their warning by placing visa restrictions and prosecute those who participated in the illegal and unconstitutional suspension of Walter Onnoghen as the Chief Justice of Nigeria". The organisations also called for the prosecution of President Muhammadu Buhari at the International Criminal Court (ICC). 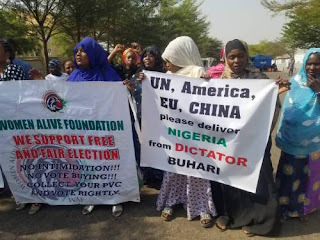 The protest took place in front of the US Embassy, and attracted the presence of several activists and youth groups, who described the suspension of the CJN by as "a threat to democracy and an obvious interference in the 2019 general election". Speaking on behalf of the group, Ariyo-Dare Atoye, Convener, Coalition in Defence of Nigerian Democracy and Constitution, said the suspension of the CJN is a "ploy to influence the outcome of the 2019 general election", noting that the action is "an onslaught against the judiciary". He said: "Justice Onnoghen was scheduled to swear in on Saturday, judges who will sit on election petitions that may arise from the 2019 elections, when Buhari and his accomplices struck on a day before to stop the action. It has become obvious to Nigerians that Buhari's only plan is to rig the elections and shop for pliable, compromised and corrupt judges who will give him and his political parties some soft landing. "This action is worse than rigging on election day. It is an obvious case of interference and setting the stage for a total compromise, and we are calling on the US/UK government to activate their visa restrictions on Buhari and his family, Abubakar Malami, the Attorney General of the Federation; Justice Tanko Yusuf; Danladi Umar, the Code of Conduct Tribunal Chairman, and others involved in the putsch against the judiciary." Also speaking at the protest, Ikenga Imo Ugochinyere, spokesperson for National Interest Group, said the President has overthrown constitutional governance. "As far as the law of the land is concerned, Onnoghen remains the CJN. We will not recognise any other person who may be occupying that office illegally. Justice Tanko Mohammed is an usurper. The NJC must sack him. Lawyers must ignore him as long as he remains on that seat," he said. He noted that Onnoghen's removal was aimed at the swearing-in of members of the 2019 general election petition tribunal. In his submission, Adebayo Raphael, Co-Convener of the Free Nigeria Movement, described the suspension as a "despotic assault on Nigeria's judiciary and the collective sensibilities of the people of Nigeria". "This is no doubt a wake-up call to all Nigerians to rise and resist the despotic reign of General Muhammadu Buhari. It is also a call to reawaken us from our docility and to tell us that when we call for a protest, the least we should be afraid of is death. No man can ever plan for death," he added.